Single door magnetic lock non-monitored. Dual voltage 12 ~ 24VDC. Current draw 12VDC @ 500mA, 24VDC @ 250mA. Built-in relay timer 0-90 seconds. Holding force up to 1200lbs/ 544kg. 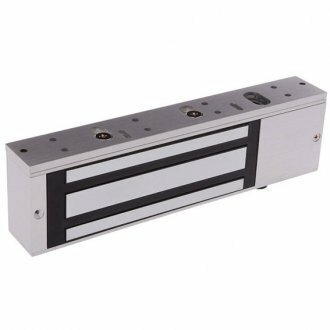 Magnet measures 266 mm L x 73 mm W x 40 mm D.
Armature plate measures 185 mm L x 61 mm W x 16 mm T.
L and Z mounting brackets are also available.